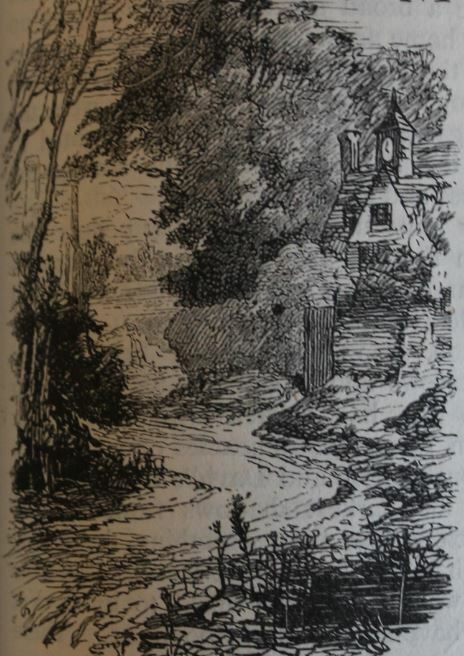 Children in a small village from the illustrative heading for ‘Voices from the Highways and Hedges’ in The Leisure Hour 1888. Like so much of England, the county of Somerset has a long and much studied history. Humans have been there since the stone age. I have never been there, being on the other side of the world, but it sounds wonderful. It is sometimes called a maritime county but the sea does not figure in any of my Somerset ancestor’s lives. They lived inland, in the hills. The wilds of Somerset may not have been wild as a colonist knows the word, but they were clearly isolated and sparsely populated for many centuries. Agriculture seems to have occurred here since the stone age or at least bronze age, so it must have pretty fertile soil. The Romans were there and left their mark. King Alfred the Great features strongly in the county history. The place took the name ‘Somersetshire’ in 845 AD. William the Conqueror bequeathed Somerset land to some of his followers and various towns can be found in the Domesday Book. It has caves which have attracted sightseers for centuries. There are several groups of hills, such as the Mendip Hills, the Quantock Hills and the Blackdown Hills. The caves seem to be all over and ancient remains have been discovered in them through the centuries. One famous cave, Gough’s Cave in the Mendip Hills, contained a stalactite in which was discovered a complete skeleton. 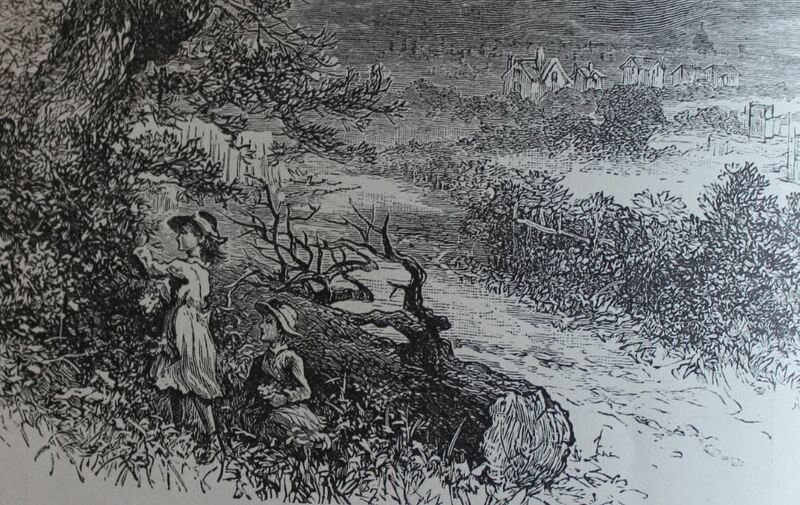 The theory in the late 18th century was that persons in the deep past had sheltered there to escape a military incursion, perhaps in Roman times. Antiquarians and sightseers commonly secured a fragment of bone as a memento to take with them. Another cave known as Wookey Hole, on the other side of the Mendip Hills, also contained human bones. The bones have now been dated to 12,000 BC with others dated to nearly as old. The Mendip Hills were home to one branch of my ancestors, but chances are they had no particular interest in the caves. They were farmers. Descendants of a well to do family which had lived there for a couple of centuries at least, but by the close of the 18th century they were beginning to feel the pinch of poverty. Not poor yet, but budgeting more and more tightly, selling their unneeded assets and thinking twice before obtaining more. Through the eighteenth century, not much had changed in the Mendip Hills. The little townships of East and West Harptree had a basic economic partnership, sometimes including the further towns of Compton Martin, Hinton Blewett and Chewton Mendip. The main city of Somerset was Bath, but from the Hills it was easiest to go to Bristol for services. Changes in the greater world passed them by. There were some lead mines in the Mendip Hills, begun long ago but mostly abandoned by the year 1800. Life went on as usual, with eggs and milk, wood fires in winter and vegetables in spring, births and marriages and deaths. They mended their gates and ploughed their fields and it all hummed along unaltered. There were few shops in the Mendip Hills but there seems to have been little need. The farms were self sufficient, the people were nearly all related and the community was tight. They had a lot of trouble getting incumbents for their churches. I have not seen a reason for this. Perhaps it was due to a shortage of ministers, or perhaps the Mendip communities were not accepting of strangers. Perhaps the community was not wealthy enough to support a reverend and his inevitably large family. Even when they had a minister, chances were the minister would perform the necessary services but did not maintain the register. It makes the area difficult to research. Luckily, the local families did not travel far. 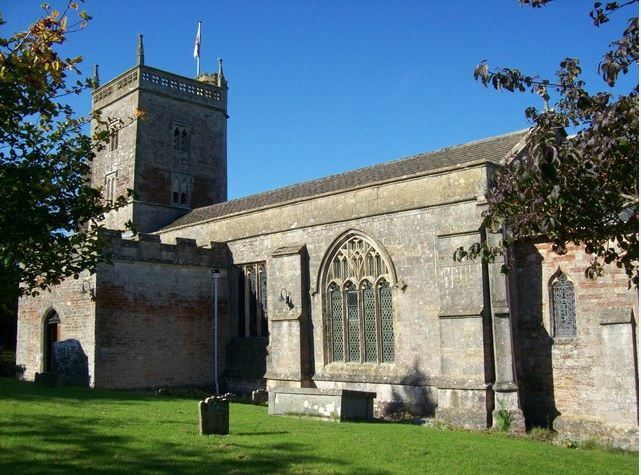 On 9th July 1825, in the church of St Laurence at East Harptree, two well established local families came together in the union of matrimony – again. This was by no means the first marriage to be found between these surnames. There weren’t so many local families nearby. Thomas Wookey was born in Congresbury in 1789, the illegitimate son of Ann Wookey. His first marriage ended tragically with the loss of both his young wife and baby daughter. The story of Fanny Eliza begins with Thomas’s meeting and marrying a second wife. Hannah Wollen was many years younger and born in East Harptree, the other village. She was a catch – young, educated and the recipient of a decent amount of capital and property after her father’s early death. She was the daughter of William Wollen and Sarah Wookey. I have not discovered whether Thomas’s father George was closely related to Hannah’s mother Sarah. It’s probable but the same surnames are everywhere here. The Wollen family traces back at least 100 years in the same spot, and the Wookey family goes back nearly as far. There could have been many cousins at the marriage. Hannah needed and received her parents’ consent to the marriage, being just seventeen. They settled in West Harptree. Fanny Eliza was the first child, born about ten months after the marriage in 1826. I like to think she was much loved. Two years later came her brother, Alfred Wollen Wookey. In this year, Thomas Wookey’s father George passed away. Also in this year, Hannah’s sister Mary was married to the Reverend John Sperring. John Sperring’s family presumably felt that he had made a very good match – the announcement was placed in many papers, something the Wollens did not do. Following the usual pattern of our family, Hannah should have fallen pregnant with child number three in late 1829 or early 1830. Probably she did. Pregnancy was a situation full of risk for any woman in those days. It is very likely that Hannah’s sudden death at the age of 21 years was due to her third pregnancy. A cause of death has not been located but this is quite probable. She was buried in August 1830 in West Harptree. Fanny was now aged three and approaching her fourth birthday. She was old enough to know the loss, but not old enough to understand it. The family would have stepped in. Wookeys and Wollens were everywhere. Fanny and Alfred may have changed home but were probably still in a caring environment. I can only guess at this. Hannah Wollen’s father had died before Hannah’s marriage, but her mother Sarah was still alive. Sarah had remarried and with her second husband, Richard Kennard, was still settled in East Harptree along with a bunch of Eliza and Alfred’s new aunts and uncles. Unfortunately Sarah Kennard only outlived her daughter Hannah by six months. If the children were in this household they may have been faced with yet another move. Fanny and Alfred were close. This snippet of information has come down through the family oral history. Undoubtedly they became close in these years following their mother’s death. These were possibly unsettling years of change. Thomas and Hannah’s marriage was young enough that he may have felt a lot of grief at her passing. He was certainly not able to care for his young children – such a thing was never expected of a man. He did, however, inherit enough money through his wife that he could write ‘Independent’ as an occupation on the 1841 census. Hannah’s sister Mrs Mary Sperring died in the fifth year of her marriage in 1834, aged 29 years. It would seem she died in childbirth. According to the death notice, her husband was no longer a reverend. Thomas’ mother Martha Wookey passed away in 1836. There were a lot of funerals in these years for Fanny. 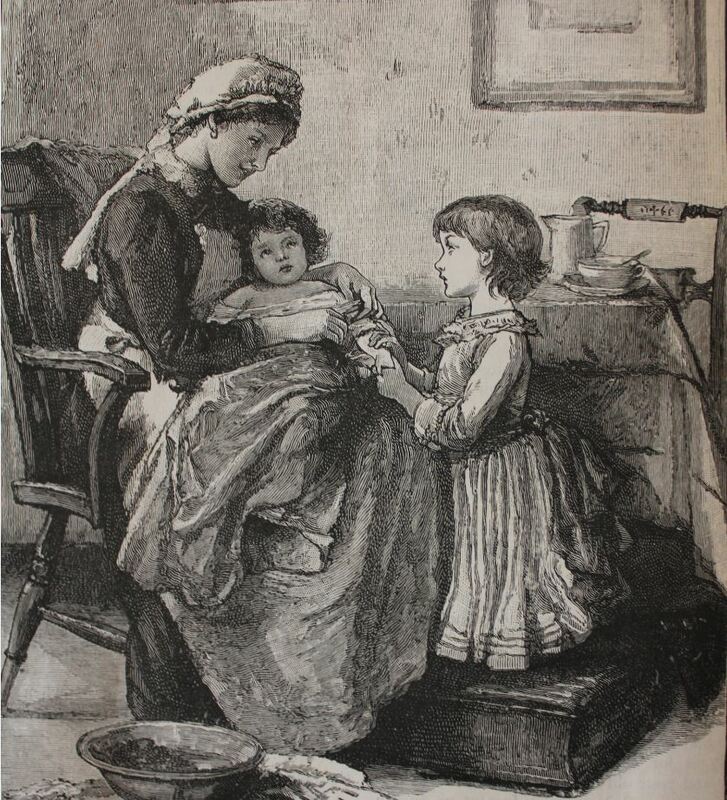 This was the year she turned ten, and if Martha had assumed care of Hannah’s two children, this might have been as heartbreaking as losing their mother. These details have not come down through the family. The UK Census of 1841 was undertaken on 7th June. On this night, searching for Thomas Wookey and his children Fanny and Alfred, I found them all living in different households. Thomas Wookey was in East Harptree in the house of his late wife’s stepfather, Richard Kennard. Also in this household is one Mary Kennard born 1826.
Who is she? If Mary Sperring was Sarah’s daughter, surely she would not have had a second child called Mary? Was this Mary a niece? Still seeking records to solve this conundrum. Alfred was in Farmborough in the district of Clutton, in a private school run by a Mr John Sperring. Not enough is known about the Reverend Sperring to confirm that this man is the same, but it seems likely. The students consisted of four boys aged around ten years – John Murless, Philip Murless, Alfred Wookey and Henry Gibbon. Also boarding with John Sperring and his students was Alfred’s aunt Matilda Kennard, a daughter of Richard Kennard and Sarah Wookey. Fanny Eliza was also in a school. She was in a property called Hallatrow House in the village of High Littleton, also in Clutton. The school’s headmistress was Mary Walker and there were five teachers. Only three students are listed but there were possibly day students also. Fanny Wookey aged 15, Elizabeth Tennant aged 14 and Ellen Thorn aged 7 were the students. Attending school like this may have been an enlightening experience for Fanny and Alfred. Already from a respectable background, they were raised in a more modern environment with more urban influences. When Fanny met her future husband is uncertain, but his family and hers had lived at an easy distance for a whole century. However, theirs was the first marriage between the two families and I think Fanny’s education may be to thank for this. The Burletons were solidly respectable pillars of the community and possibly determined to maintain that status as their position in the community crumbled in the present economic depression. They mingled with lower aristocracy and employed many workers. Francis Burleton was a corn dealer, the son of a miller/grocer/merchant and the grandson of a very wealthy local farmer. It seems likely that he met Fanny while she was still a school student, or when she had newly left school. They married in East Harptree in 1844. Fanny was eighteen years old at the time of her marriage and her husband was ten years older. Francis was a man of good education and big dreams but little practicality to go along with it. It was an unfortunately common mix for the times. Fifty years earlier a good education was all that was needed to ensure a man’s future. Now in the big education boom, times were changing. There were men who could read, write and add up everywhere. Fanny found herself a good husband, but marrying him was not a passport to an easy life. No doubt Francis had visited the caves in the Mendip Hills, and pondered over the origins of the bones. He was that kind of man. But he wasn’t so good at predicting and preparing for uncertain economic times. Fanny and Alfred continued to be close friends, despite their different futures. The two maintained a correspondence their whole lives according to oral history, although I have no idea if the letters still exist. The brother and sister ended up in different ends of the world. Having traced so many ancestors who clearly lost sight of their siblings through the challenges in their lives, it’s lovely to learn of some who maintained contact.